Everybody knows Jackie Chan. He’s a martial artist, an actor, a filmmaker, a singer, and more. What he is not is a bus stop in Sichuan, China. 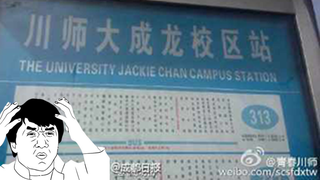 As noted by Austin Ramzy (via Eric Jou) on Twitter, the bus stop named “The University Jackie Chan Campus Station” is apparently a computerized translation fail. The institution is Sichuan Normal University, which is the oldest teacher college (aka normal university) in the region. While you might think the sign looks Photoshopped, Chengdu Daily confirmed that it’s a real mistake and reports that the goof will be replaced. I hope the new sign reads “The University Sammo Hung Campus Station.” As it should.